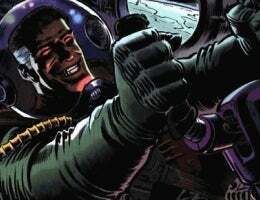 Time to Make a Movie Version of "Astronauts in Trouble"
In a world where it seems as if every comic ever made has had their movie rights optioned, the lack of news about a future Astronauts in Trouble movie feels more and more like a failure on Hollywood's part. The indie series of graphic novels centering around TV news crews and astronauts getting in and out of - you guessed it - trouble seems custom-built for a multiplex near you. Larry Young's trilogy of books (illustrated by Charlie Adlard, with Matt Smith providing some art in the first book) - Live From The Moon, Space: 1959 and One Shot, One Beer - is much less space opera than space rock'n'roll, three books in a shared universe concentrating on the simple thrills of adventure, space travel and good old-fashioned storytelling. Each book involves a crew from Channel 7 News getting mixed up in some space-related plot courtesy of bad guys who are easily identifiable and easy to root against; Space: 1959 sees the news team take on Communists who are racing to put the first man on the moon... and are willing to kill to make it happen, for example. Who needs more of a high concept than that? There's always something going on with the astronauts. Who doesn't think embedded reporters on mankind's return to the moon isn't a going concern? The thing's been optioned three times, and I'm sure it's out there in the consciousness. I sure do get a lot of atta-boys on that subject. Meetings are being held; the moon is being discussed. With a summer slate of movies stretching out ahead promising all manner of thrills, spills and psychoanalytic takes on childhood heroes, one thing is clearly missing: Astronauts who happen to meet with calamity. It's time to fix that, Hollywood.